Looking at my cake, 10 candles on it. This is when I remember the first wish I ever made…totally innocent to the world. Looking over the beautiful native bush of the west coast of the south island, I can see the other side of the valley and the river between this housebus and itself. I wished/prayed..spoke to the universe from my head, and the whole of belief of my heart to whatever was listening. pressing my eyelids together, took a breath and made my wish… I was happy but was in search for more. This isnt about sadness, or me being in a chair… its about having a chance to view the world from a different perspective. So this blog is to follow me while im travelling, to laugh and love with me as I figure it all out. I had a car accident when i was 4 and a half, mum fell asleep at the wheel and the car drove off a bank in between nelson and motueka in New Zealand. 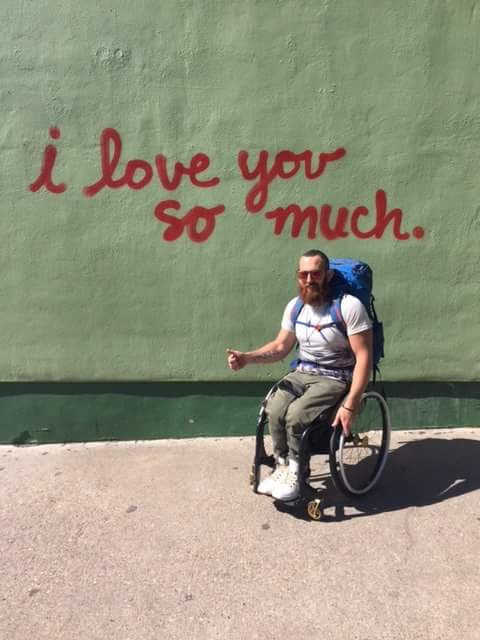 Im in a wheelchair and have been since, as a quick run down as to how my body functions..it was my lower part of my spinal cord that was damaged. I can move my legs a little bit. i can only engage a couple of muscles in them faintly, but as someone in a chair who meets other people in chairs and all ranges of disabilities, the smallest of functions help with everyday life e.g. transfering, balance etc, we can all be thankful for something that someone else may not have. My whole life since my first wish Ive been searching, For happiness, fulfillment …something that made it all worth it. I’ve found it in sports, love, friends, career, learning, music, beauty, simplicity, challenge, fear. Now im searching through the experience of travel, the chance to put myself out to the world and see how it replies to the questions im asking. From the outside it looks like a quiet year has slipped by, with only the odd Facebook update or Insta post. It is ironic because after all that wandering, I came home to be completely lost – maybe that’s just what happens as you exit your twenties? But when you ask me about my year, I will say it was filled with kind hearts and loud laughs, languages and new friends, vibes right and starry nights, music and dancing until 3am. After being the best man at a beautiful wedding and then returning from a big basketball competition in Beijing (The two reasons I returned to NZ) I looked for a place on my own, and found one out in the most raw and beautifully rugged places – Birdlings Flat. I had nothing planned in front of me which is unusual, its always been move out of home, finish studying, train and work towards traveling…now I am back…crazy. The first few months back was an internal clash of my mind wanting to be free but also wanting something to have a fire and drive for a goal – so I waited it out and let things evolve naturally. The house I rented backed on to the beach at birdlings flat and I spent the whole summer drinking wine, playing music, finishing ‘A Backpack, a chair and Beard’ the book and watched the sun go down on that beach. After a while, I went back onto couchsurfing but this time as a host. Then I spent the next few months doing much of the same from summer but now it was with travelers with all equally amazing stories, some of their journeys just starting and some journeys ending….I could relate. some shaked with excitement as they started on their way and others cried as they say goodbye to their adventure and make their way home. Everyone that stayed though left an impression on me, and I am heading in the direction I am now because of their stay. 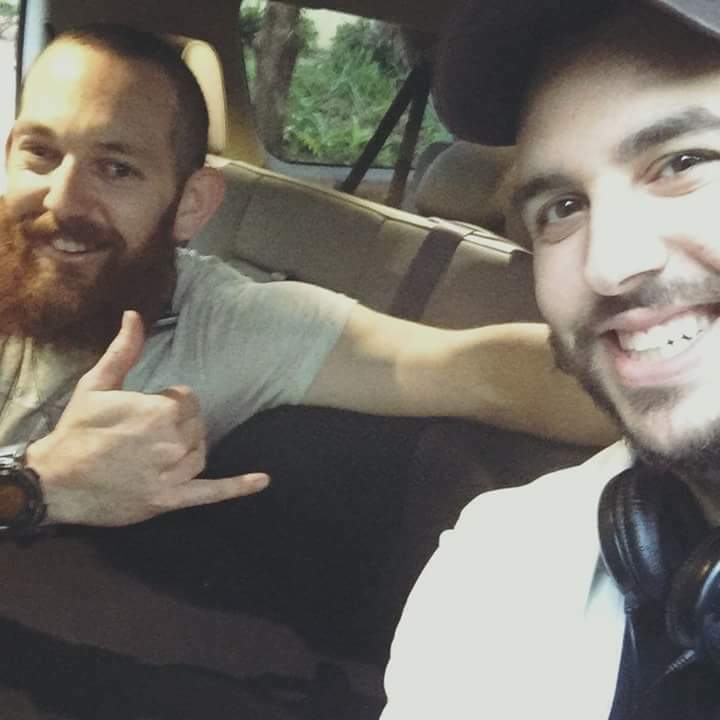 One of the times I picked up a wicked Austrian, Dan, straight off the place….took him for a sunset beer and then dragged him around town to various live music gigs before we made our way up to a New years gathering. Then another – Alexis, the uni-cycling Frenchman, I took to watch my younger sister run her cross country race and then we spent the week learning french and laughing. Dodo the crazy German was my favourite, driving up the hills on the quadbike to watch the sunset and coming back down in the moonlight, spending a few days out on the beach yelling out at the angry ocean. The list goes on with crazy stories to be told over a nice cup of tea in a few years time, if you are wondering to host travelers…do it, what an experience. Now here I am, on a Thursday night in September…Birdlings flat, been and gone…as I ready myself for my next adventure – where to next for me? well you will just have to wait and see… 😉 ….. à bientôt mes amis!!. A year after the year – without the details. The definition of home has now changed for me, where as home to some may be the house they grew up in that their parents still live in, or maybe the city they grew up in…as I sit here reflecting on what has just happened in the last year, I learned how to make a situation my home in a very short amount of time. 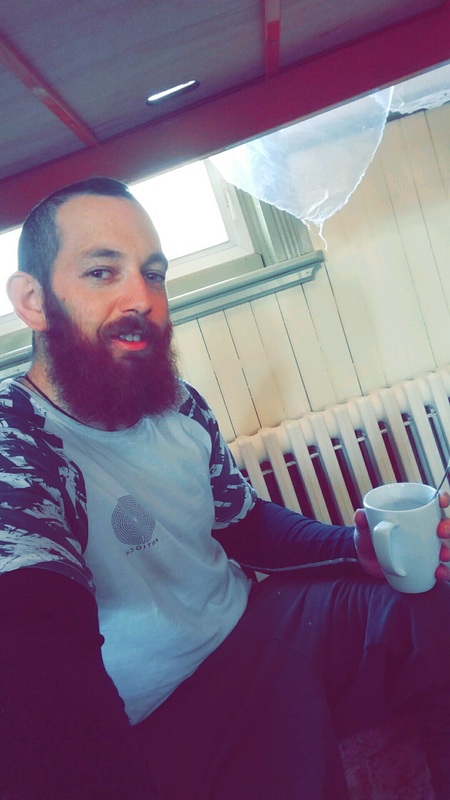 I was assumed a few times (I imagine because of my big beard) to be homeless, my response being I am not homeless, I am home free. Free to make the world my home, to have a home here and then the next day my home there. I admit there is a warm feeling of familiarity as I come back into New Zealand though, I enjoy and soak in this feeling. For sure arriving back into Auckland airport in New Zealand was a strange thing after being away in the other hemisphere for nine months. The vibe was light, and strangers around you made jokes and conversation as if you were family. Also taking me a day or so for my ear to adjust to the accent as I had not met many Kiwi’s on my travels. Sleeping on a friends couch, thinking about where to from here…working, training and catching up with friends over a coffee just as I was before I left. Another two months and it will be nice and warm for our christmas. It still blows my mind how quick a year is rolling around…and how quick the now becomes a memory. I’m not quite ready to be living in memory just yet, I have no reason to. Its time to go out and make them while you can. I have questions to be answered, how far can I push myself?…how lost can I actually get?. The questions will evolve the more I search I’m sure but I wont be able to see anything if I have my eyes closed. What are your questions? where are your eyes right now?. 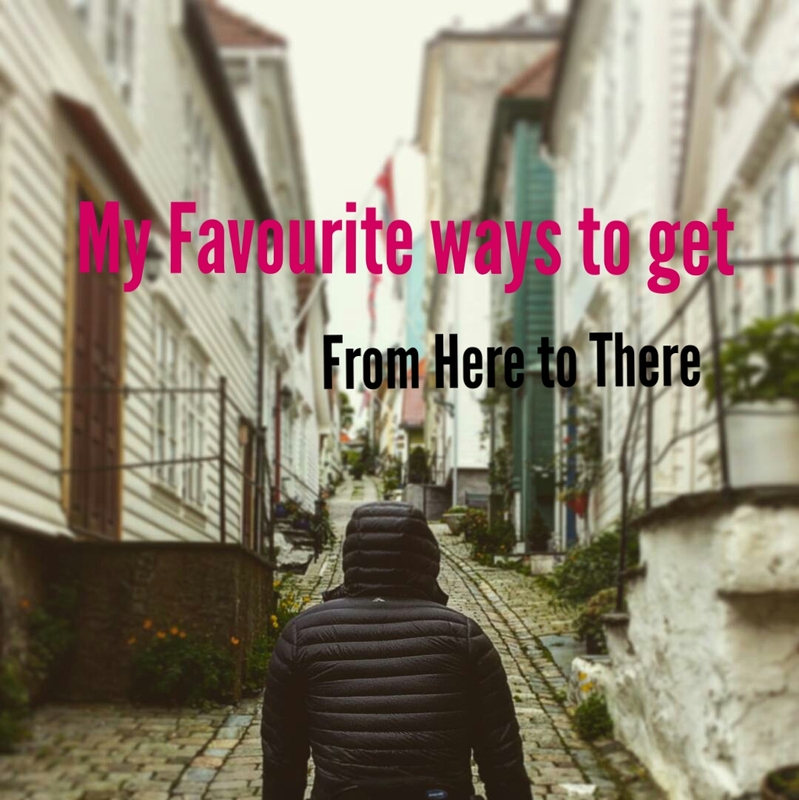 Everyone probably has there favourite way to get from here to there while travelling, here are mine. 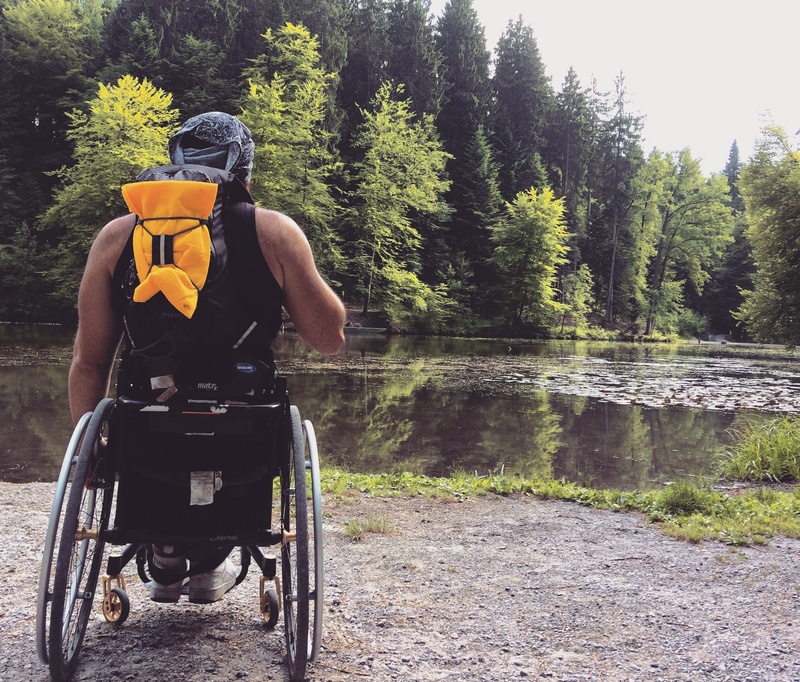 Travelling all around the world for 8 months now, also having travelled alot for sport all over in the past I have tried many different ways of getting around as you can imagine. 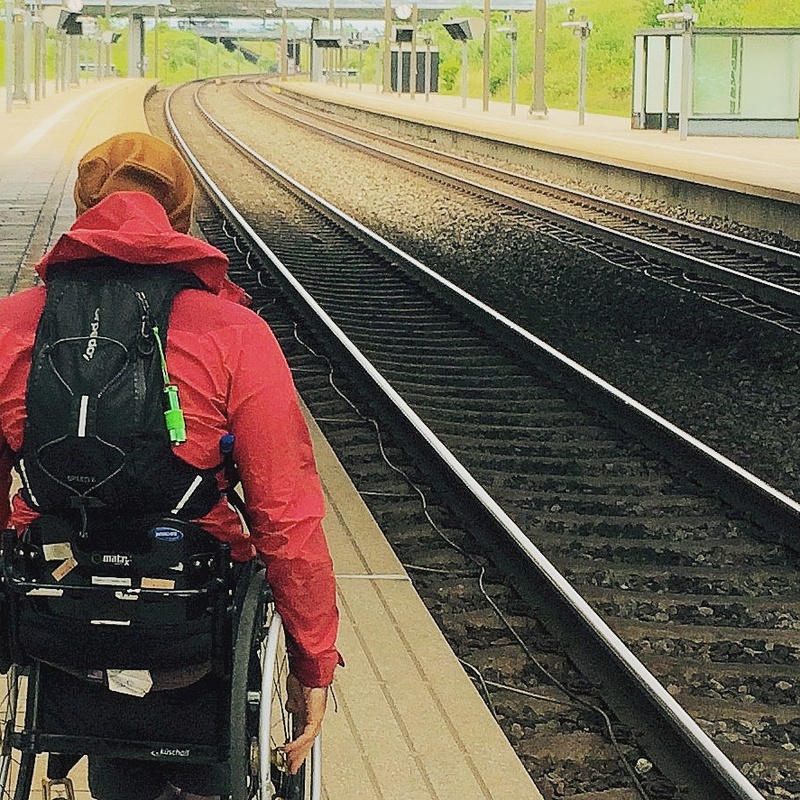 Being in a chair dictates a little bit on my favourite way to get around while travelling…But I love to travel, and there are so many ways to do it..chair or no chair. 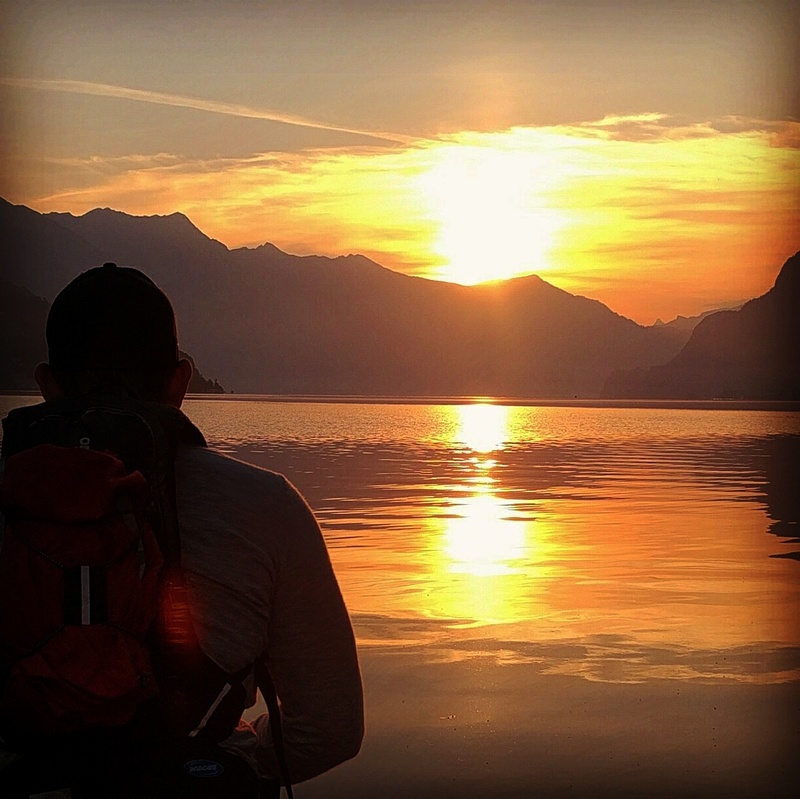 A sunrise in Interlaken, switzerland after a night of freedom camping in the trees. Pushing, now that’s my favourite by far..I guess most of you would call it walking though. I must have pushed 1000s’ and 1000s’ of kilometers while travelling, or even in regular life I prefer this. I’m someone that loves to get lost up in my head a lot.. so pushing means I get that blood pumped around, I get to look around and lay on the grass immediately if I please and most of all I get to control where I go without bothering anyone. 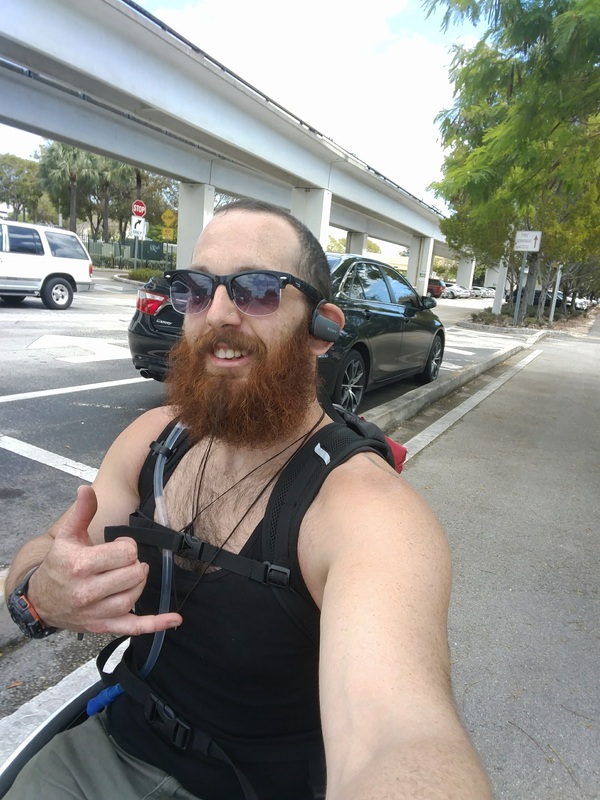 This is definitely why I pushed from Miami to Key West in my 160 miles of freedom (click link) and why I have the loving urge to push long distances. Its like the feeling of riding with the top down on a convertible but times a million. Also perfect if your on a budget, as the fuel is cheap…a few bananas, a sandwich and maybe a coffee. 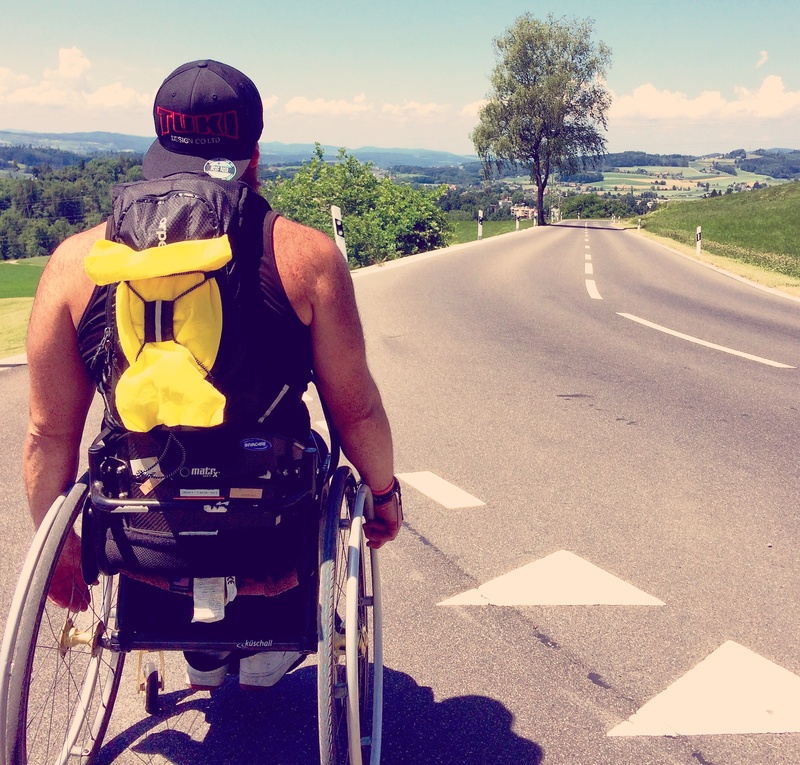 Pushing along the road in Switzerland, and looking back down after a long push uphill. Drink break in while pushing through some Switzerland forest. My second favourite is hitchhiking, although slightly less relaxing if you are worried about people staring at you as they drive on by. The rewards from pushing along the road and putting yourself out to the universe for someone to pick you up, and I’ve always had amazing people pick me up. They always have a story and So do I so its nice ride. Also its a nice mix between being out in the elements, having time to think and also not having to spend days walking 100s of kilometres. Plus again is perfect if you are travelling on a budget…definitely give it a go once for the experience. 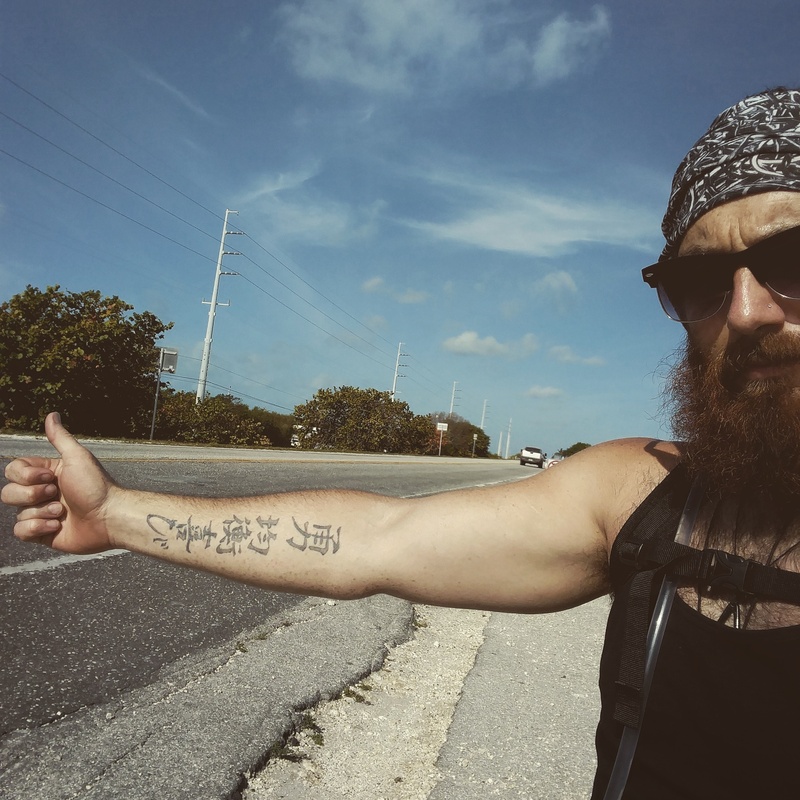 Hitchhiking across a 7 mile bridge in the Keys in America. I always like having the ability to follow where my heart wants to go with the least amount of drama about changes to plans at the last second, so renting or borrowing a car is my next choice. Also the great thing about a car is that you never have to worry if you get stuck somewhere without accommodation because you have it with you and you can park your accommodation where ever you heart desires. 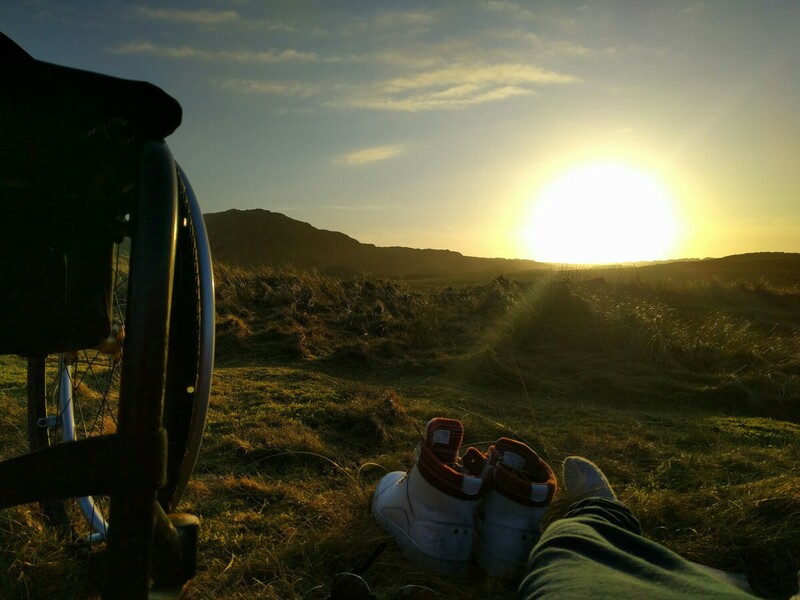 The more expensive of the top 3 choices but is worth it if you can, you can cover long distances in a short amount of time with the complete luxury of being able to go where you want with no dramas. Finding a car with handcontrols can be a bit of a mission though so the top 2 for me end up being easiest most of the time…but that shouldn’t be a problem for you. 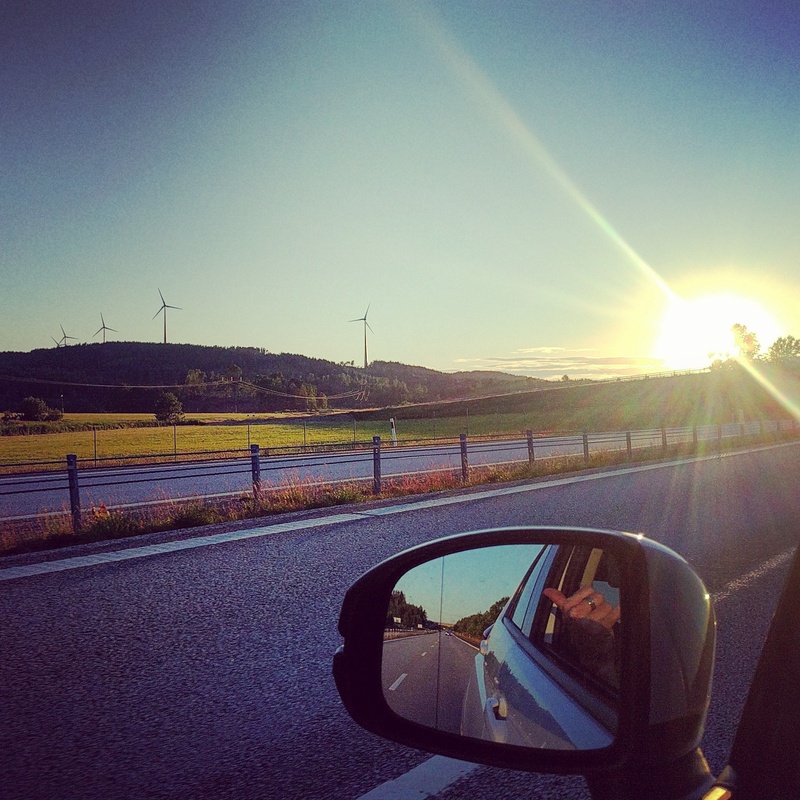 Roadtripping through Sweden in a rental, sleeping in the back anywhere the heart desired. Now when it comes to buses and trains, I prefer the trains even though they are more expensive most of the time..for long or short journeys. They are super easy usually to get onto being in a chair as they are platform level or have lifts, and I can get on with the least amount of people looking…ANND there are toilets on them. Then sit back and enjoy the scenery. However when I have to be money conscious I end up catching a bus because they have generally been cheaper. Catching a train in Denmark, little did I know I was on the wrong side and would end up in Sweden. If it weren’t for the long distances to travel, and the fact I get to watch so many movies in a row I would choose planes last. Purely from the point of view of being in a chair I would say…lines, check in, getting to the toilet, having to be on time so you don’t miss the flight and sometimes having to get on in front of a whole plane make it my least favourite. That sounds all very negative but they are fine, and often cheaper than buses and trains but I just prefer every other possible way of travel first. Music has always been a love, it is something that has made life beautiful for me. I listen to music everyday and it can take my imagination to wonderful places. I taught myself the guitar around 22 as a way to make my own beautiful sounds, and as a way to express myself the same was I get to express myself with writing. I loved to pick up the guitar after work and just jam out, and I travel around with my guitar even as bulky as it is because when I watch the sunrise, or amoung a beautiful mountain looking over what seems to be a dreamland..the first feeling I get is a feeling of wonder and beauty, I feel the same way with music. Keep up the love my fellow nomads, wanderers, vagabonds and beautiful people. So comment below anything, words, phrases and emojis and let’s inspire each other. 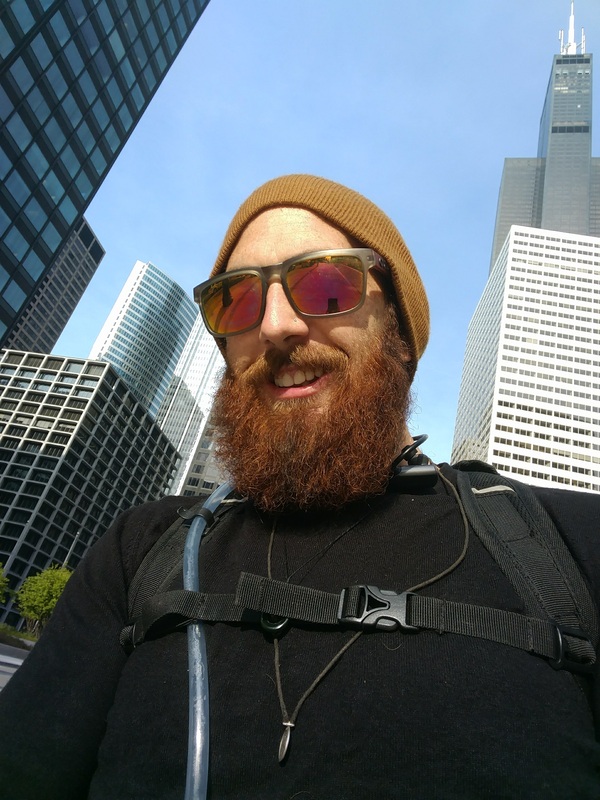 7 months into my worldy vagabond, I’ve grown a beard and I now travel with just a small camelback day pack and a guitar.Enough to hold some books, another set of clothes and chargers for the devices ive decided to use to share the journey with everyone. After letting go of the things I didnt need in America, I now find myself looking at what im using in this moment in France and that I feel all I need is the clothes Im wearing now. I have the urge to liberate myself from everything and emerse myself into either complete wilderness still or now into a country alone where I would have to learn a new language to communicate. However the urge is strong for me to let go of everything, I could quite easily at this stage travel only with my clothes on me and my passport. I want to take the opportunity while it seems easy to do so before the temptation of material life becomes inviting again. All I’m feeling now is the same feeling that I had the years leading up to me travelling as I am now, Im waiting and enjoying the time until I am presented with the right moment to let go of everything and start the true life of a Vagabond, or go bush for a while. I picture myself in a bit of land on the west coast of the south island completely in it. Like a man in the movies stranded on a island that has to let go of his modern world and learn to live off the land to survive, build his shelter. I picture myself using all my physical and mental energy not to earn money, but to be swinging through that native bush in my chair on ropes from the trees and building a home with intricate systems like water, and ways of permaculutre. Allowing my creativity for the way I live to evolve, approaching the normal things like getting from A to B in a different way where in the past I would want to fit in and the world is made in such a way that I can just push on a path of some kind, but in the bush that seems illogical to either build a path right across or try and push the terrain…why not strap myself to my chair and swing like tarzan?. I want to have the chance to approach life differently than these last 28 years so far. I imagine that all this will happen once I have finished travelling with Julie in Europe, and I have finished with the 3 months training for the New Zealand basketball team I plan on doing before we go to Bejiing. Even though my drive is towards the path of continuing to let go and head down a path on which I cant see past the start, I have these little tangents off the path which I can enjoy. As long as I keep an overall focus and direction towards the main path of which is grabbing my eye I can enjoy and be happy with these tangents. This is exactly how I felt with this world vagabond that I’m on now, I was doing my engineering apprenticeship, training for basketball, taking up other hobbies and interests but my main goal was to start to learn to let go and get away from all that, and everything I know. I could not wait to start this, and my heart was never free the whole time, the 6 years or so while I found my way to get to this stage. I learned to enjoy all the tangents off the path and the journey towards a path in which I couldnt see past but was excited to get the the start of. Everyday is a beautiful day, I learn and I live. I learnt alot from my travels in america, All the media, the political climate and being on the other side of the world in New Zealand meant that subconsciously I made a wrong opinion of this wonderful country. Some of us have different accents, and different cultures and live in totally different climates…But one thing has become apparent to me, and that is that ultimatly we are all the same but different. 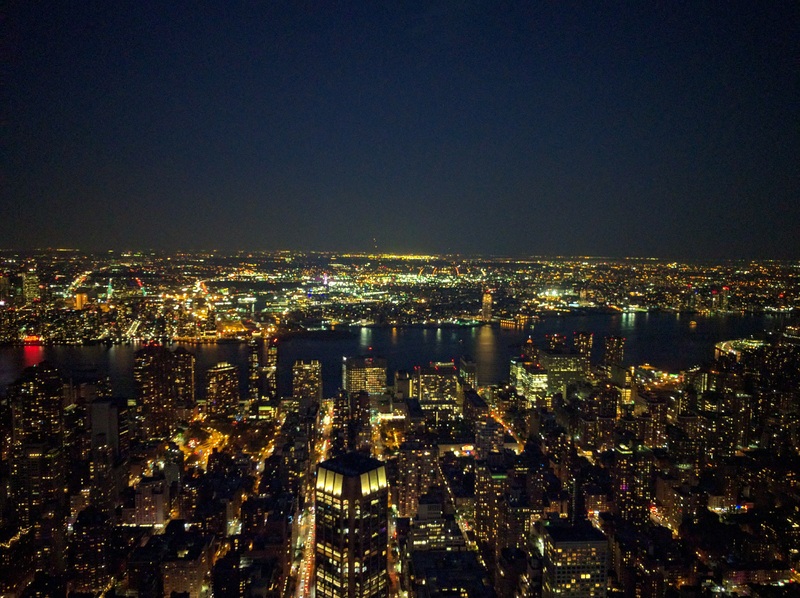 Our views can slightly differ but we are more united than it seems sometimes, some people have their proctective barriers higher than others but their intent is the same as yours….there is hope yet, keep being beautiful. Flying into Newark,NJ to start my American adventure was a shock to my system. I knew no one here, had no plans and was a true test of my ability to adapt. Pushing around in circles around the airport trying to find a payphone that worked was my first fluster, looking a bit silly as I pushed my basketball chair, big backpack and guitar around past the same people. Something as small as using a phone changes…It didnt help that people here didn’t have any time for you and were abrupt, that made me want to get back on the plane and head back if America was going to be like this. Luckily it isn’t and it took me a week to figure that out. 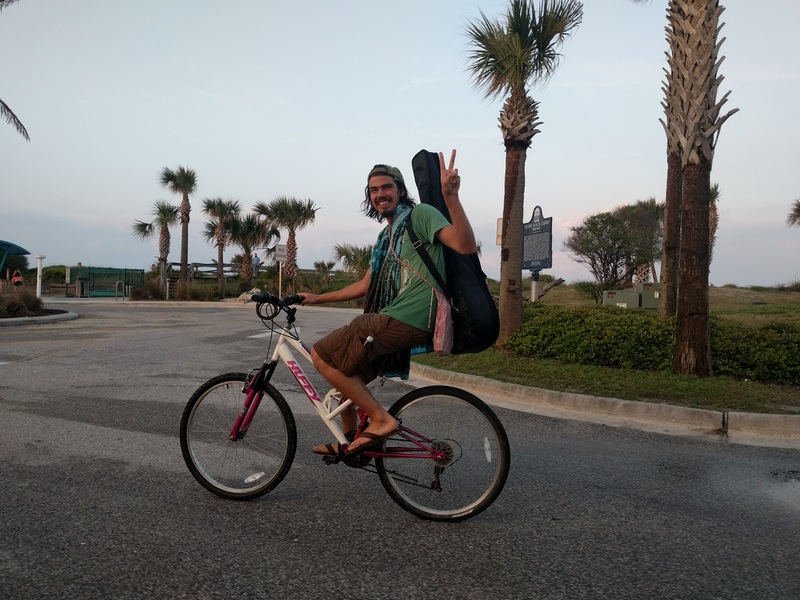 My big plan was to buy a van, travel around with my basketball chair and my guitar playing ball, sleeping in the van all over the states and playing guitar out of the back. That plan came crashing down after a few days of trying to buy a vehicle, the process was too complicated it seemed. Sitting in the hotel in Newark trying to figure it all out, knowing that I only had a few thousand dollars to last me 3 months and then I was off to spain…How the hell was I going to do that?. I got further flustered by Newark and was desperate to leave for the sake of my positivity so I got in an Uber and caught it down to Philadelphia, booked a week in a hostel there. First off I had to find a way to store my basketball chair with someone as there was no way I was going to be able to afford to Uber everywhere, and I planned to hitchhike now. Secondly I really needed just one person to get back to me from this workaway site, workaway is a cultural exchange\volunteer programme where you volunteer 4-5 hours per day with someone and they feed you and give you a place to stay while your there. After lots and lots of messages, one person…Priscella gave me the shot at proving that the wheelchair wouldn’t stop me from going into a house with stairs, or doing the work that they had for me. I would figure a way out but just need someone to give me a shot so I could get a reference saying that the chair wasn’t a problem. So after a great week in the hostel in Philly I caught a train down to Harrisburg, Pennsylvania. In retrospect I should have caught a train from Newark to Philly after I experienced how easy it was to catch the train. The next two weeks I spent in locust gap, it was perfect to do some adjusting to America and also to have the time to adjust my directions. I was staying in a converted church, this creative heaven where I was helping paint radiators for my work. A massive snowstorm hit Pennsylvania, with snow up to the height of a car and stuck inside for a few days it was safe to say I was itching to get out and explore and feel that chilling air. So St Paddys day the local fire brigrade was holding a function for the locals, so I just shovelled myself a pathway in the snow and made it over to this funtion. Being a Kiwi is a bit of a novelty and it seemed especially here as there were some people that had never even met someone from another country before which totally blew my mind. After 2 weeks I was ready to make my way to another state, I had thrown out some emails on workaway and a few people had gotten back to me. Deciding to take a linear direction trying to see as much along the way as possible I decided to go down to florida and flying was the cheapest way this time around so I flew down into orlando leaving my basketball chair up in the church with Priscella which was an amazing weight off my travelling shoulders seeing as I wasnt going to be doing the basketball tour I orginally thought. My plan of travelling was to finally be able to embrace my go with the flow attitude, to go anywhere, anytime at the whim of my hearts desire without it affecting anyone in a negative way….I was starting to flow, each day I was getting more confident in the fact that life was going to provide me with a positive experience regardless if it was 11pm at night and I had no where to stay and I was in a new city. I arrived into Orlando that night, having to find a way to Saint Augustine tomorrow to meet with my next workaway host. 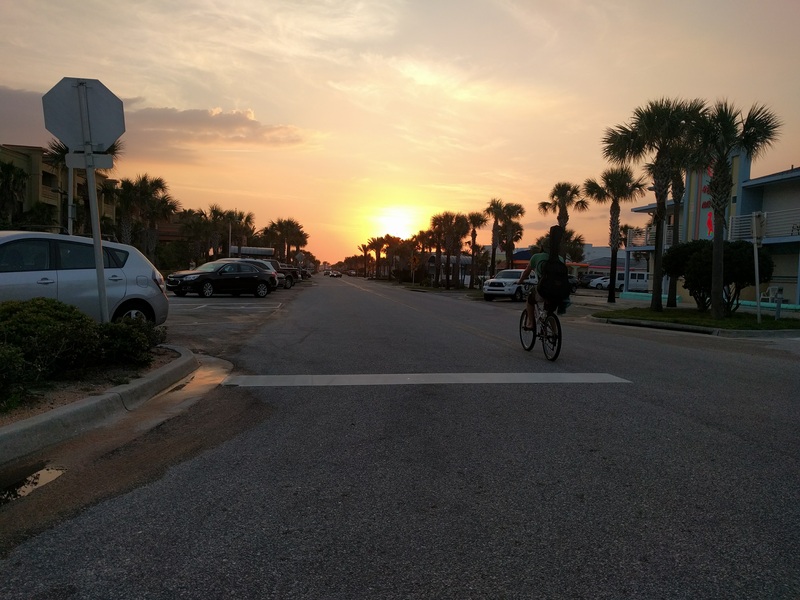 I had no idea how to get there, but I got up early and watched an amazing sunrise over the water and set off to hitchhike to Saint Augustine. Wow from snow to this heat was a shock, especially now that I pushing a distance with this big backpack. Pushing on the road now because I ran out of footpath and look at that I found a train station. 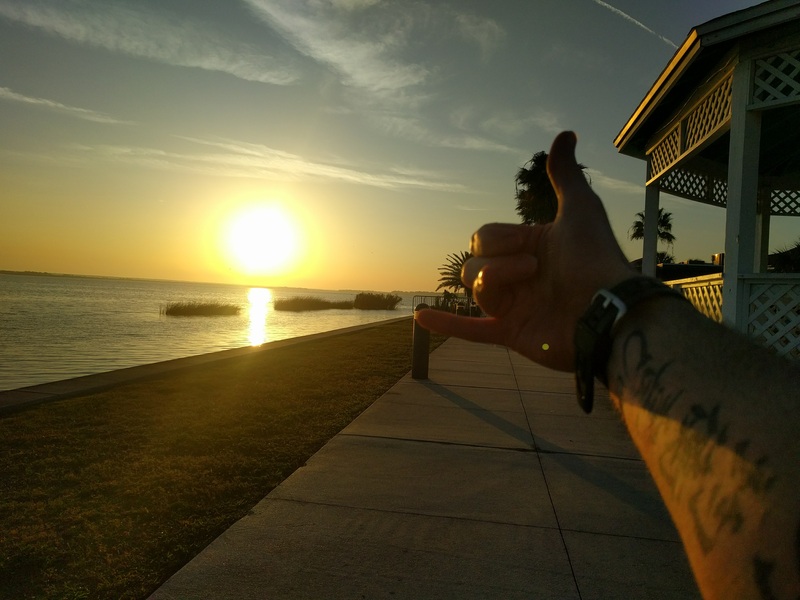 So I caught a train up to Palatka and was trying to hitchhike the rest of the way at 7pm…Not having much luck, and wondering why. Joseph and his aunty shouted across the road from their rental car and asked if I needed a ride…Aparantly its Illegal to hitchhike in florida he told me, but he had seen me on the train and picked up his first hitchhiker that day. Saint Augustine, what a memory it gave me. Firstly Venessa, Heidi ( her daughter) and Kim were so inviting. Having people in your house that you have never met gave me the belief in the world that I needed and had been searching for. To trust and love without having anyting intially in return. I helped Venessa around the hosue, and did some gardening and also we went out one night to see the Saint Augustine nightlife which was a cool experience. Also Venessa is a Sign language interpreter because Heidi is deaf so I was so happy to be learning some more language, I learnt alot about sign language and by the end I could at least spell the words and was capable of having a caveman conversation…but none the less, still capable of communicating simply with someone. We all meet those people who just influence us majorly at that point of our lives, This person has something that you aspire to learn, or gives you a perspective that you couldnt have seen before. Jan, a 21 year old guy from germany was the person of my travels that influenced me the most so far. Everyone I meet has an influence on me but Jan was a projection of how I wanted to be. I went travelling to let go, to REALLY let go. To become as free as I could possibly become, free from what I think of myself, others and everything else that fills the mind. To really expand my awareness of my sorroundings on a broader scale than just my life and the city I work and live in. To finally accept my place, and finally start going with whatever flow that I was meant to be flowing with. Jan had let go, he was sharing his love with everyone, smiling at everyone, going with the flow of life…he had put himself out to the world a couple of years earlier, cycling down the entire west coast of the States from Vancouver to San Francisco along with all his other amazing stories and lessons. Jan seemed free, and thats the direction I’m trying to head. Jan was doing a similar exchange with Kim, Venessa’s friend and Kim lived down the block. So we would pop over to each others stay, have bonfires, sing and exchange our stories and true thoughts and we even went busking together in Saint Augustine. One particular experience stood out to me though, our wander over to Vilano beach. 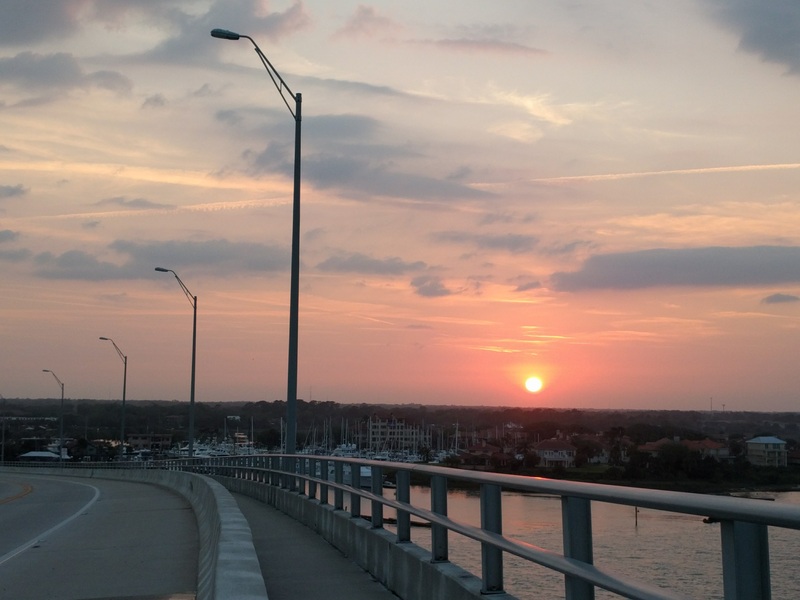 It must have been an hour bike ride\push from Venessa’s to Vilano and between Vilano and Saint Augustine there is a Intercoastal bridge with a high arc to allow boats to go under…probably 10 minutes to cross on the bike. As soon as we started up the bridge, a powerful thunderstorm hit out of nowhere and had this wall of rain hit us, me in my singlet and Jan carrying the guitar. The power of nature was beautiful and a reminder of what true power was, the huge cracks of the thunder right above us and the rain hammering us. If you haven’t gone out in a thunderstorm or rain then I recommmend it, there is no reason to be afraid of water. So much of us is made up of water and mabe one day we may not have this precious element so readily available…it is an refreshing awakening. As soon as we got down the other side of the bridge the dark clouds left as quickly as they came and the sun was shining and within half an hour I was dry again. 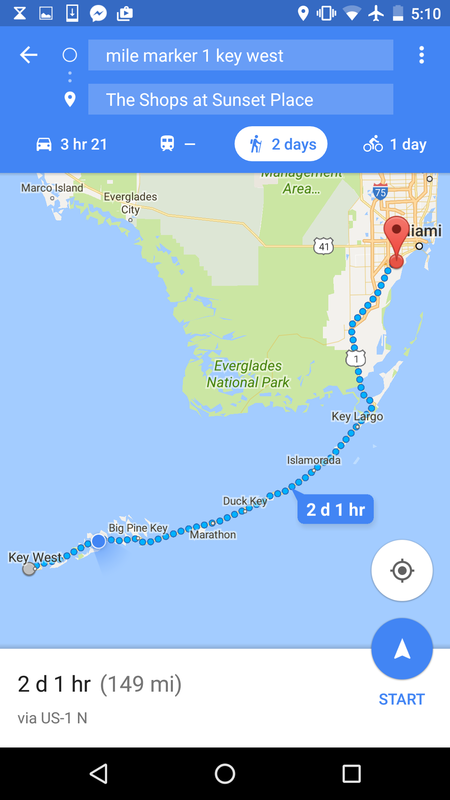 While in Saint Augustine, someone told me about the celebration of the sunset in Key West, the southern most point in the USA and that sold me on the idea of going down. Venessa suggested that I go down with Heidi to visit and stay with Heidi’s father, John. We caught the famous greyhound bus down together to West Palm not far out of Miami. John was awesome, 70 years young and full of life and very chill. We got on well, played music and philosophized the days away. Heidi also was going to go visit her brother who was also in a chair, Edward, in Miami. 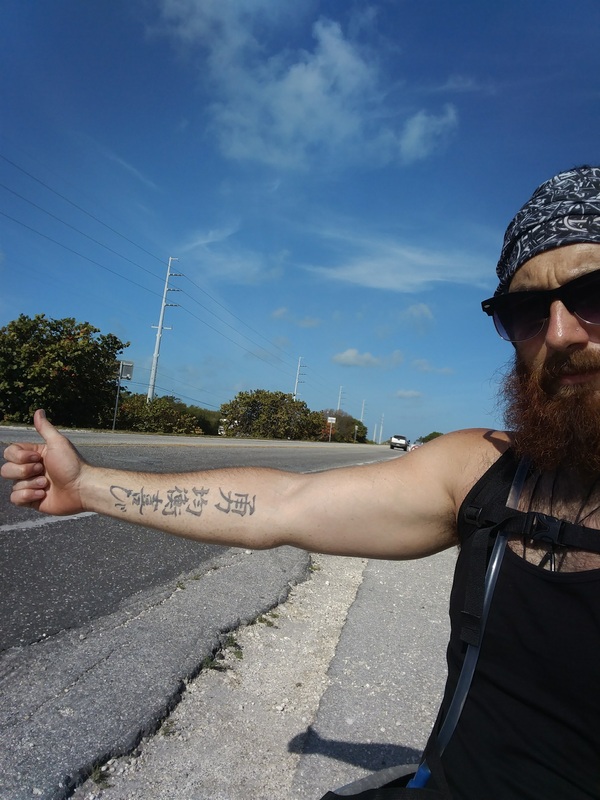 I had decided in those few days that I was going to hitchhike down to Key West from Miami and instead of taking that monstourous backpack I left it at Johns, along with my guitar and took a small camel pack with a charger, jacket, book and a couple of other small things. Little did I know that when I got to Edwards someone was going to tell me about a cycleway going pretty much the whole 160 miles from Miami to Key West, so I decided that I would push instead and Edward offered me to stay the night which was awesome because it was 3pm now and would prefer to leave early in the morning. All I can say is thank God for the camel pack, because it was so hot and wheeling 20-50 miles a day meant I was drinking ALOT of water. I made the mistake of not putting sunblock on the first day and I ended up with terrible sunburn, lesson learnt that day. 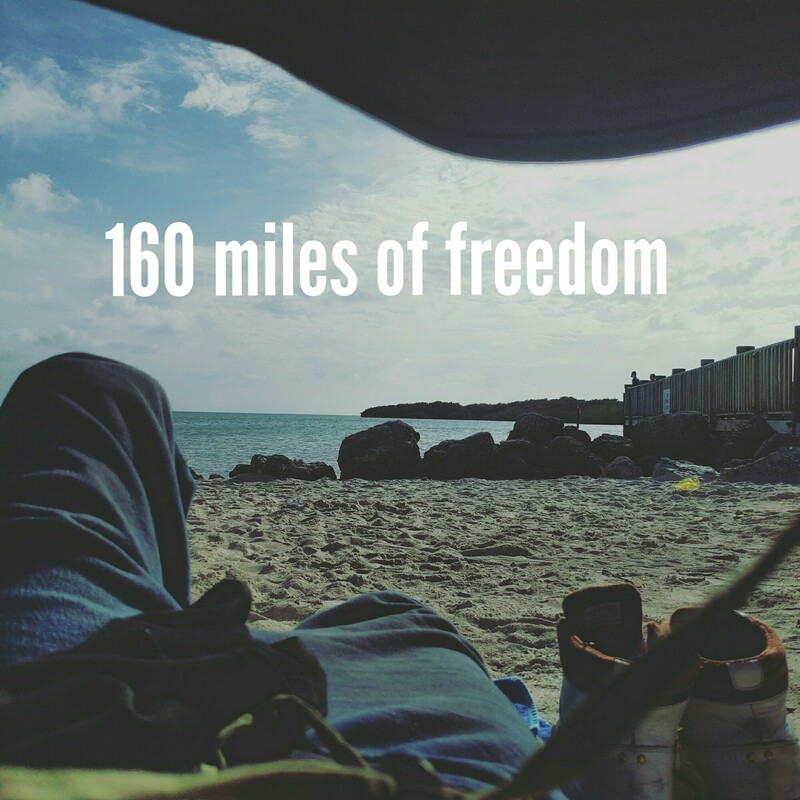 I made it the 160 miles, after bridges, sleeping outside, pushing all night, couchsurfing on a boat, being sticky with sweat the whole time and pushing my little heart out. I have a video which you can check out, the link is below. That was a massive lesson for me in the amount actually needed to survive and how much I enjoyed travelling with less. 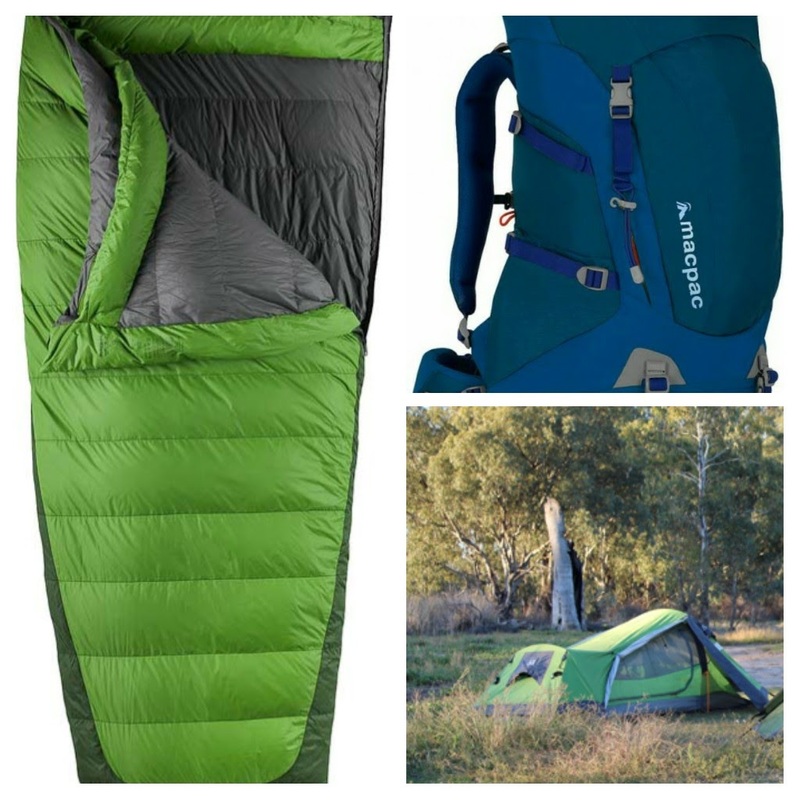 So after the week I spent doing that, and getting back to John’s house I had decided to give away my backpack, sleeping bag and tent because for one I didn’t need it as much as I thought and in fact I enjoyed having less. And two I wanted to teach myself to become more of an expansive soul, sharing my love and giving without intent of recieving. Its funny because the year before I came travelling I had got a loan to get all this gear which cost me around $3000 and now I was giving it away. So I set up a video, put it up online for anyone who may need a hand starting an adventure and said I was giving it away. 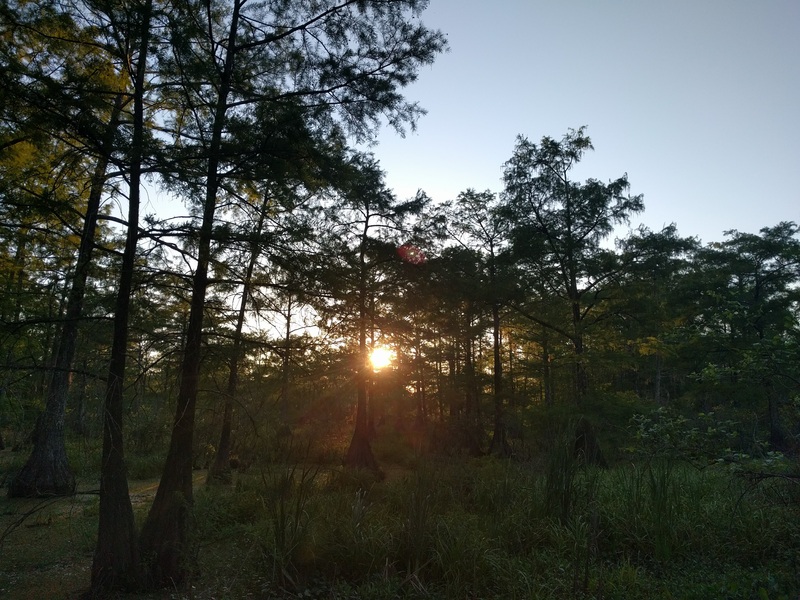 The next workaway was in Lafayette, Louisiana with Trent and Linni. So I caught a 22 hour busride to lafayette, its a long ride with interesting people along the way. A young guy who had just started learning about permaculture and he excahnged books with me, gave me his Bhagavad-Gita which meant alot. Also a lady shouting that Jesus will heal me at one of the bus stations at 1 or so in the morning…I tried not to encourage her, but said thank you and carried on. Arriving in Lafayette at 5 in the morning and not wanting to wake up Linni and Trent I waited there a couple of hours, met a dude who was homeless and took him out for a classy Burger King breakfast, gave him my headphones and wished him luck on finding a home and work. 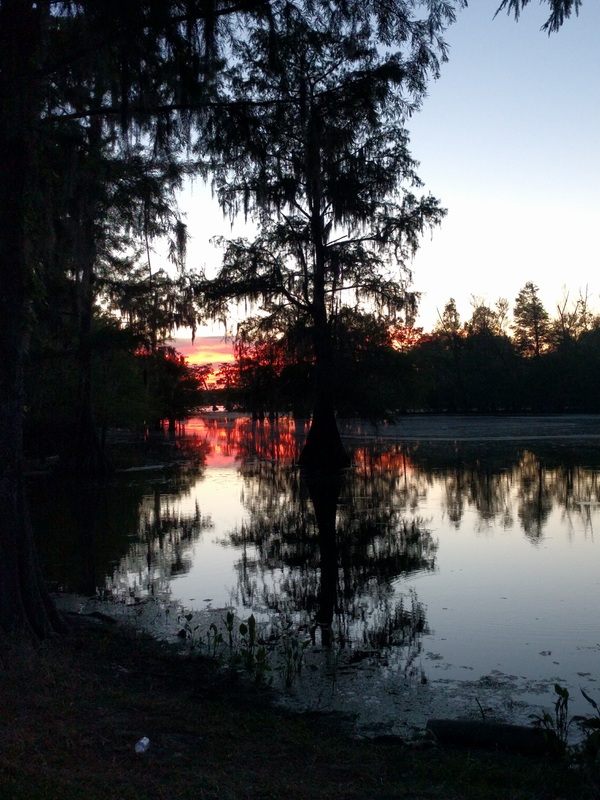 Lake martin, swamp land in Breaux Bridge. How amazing is it when you have no plan and then you arrive on the weekend where Lafayette is having a International music festival. 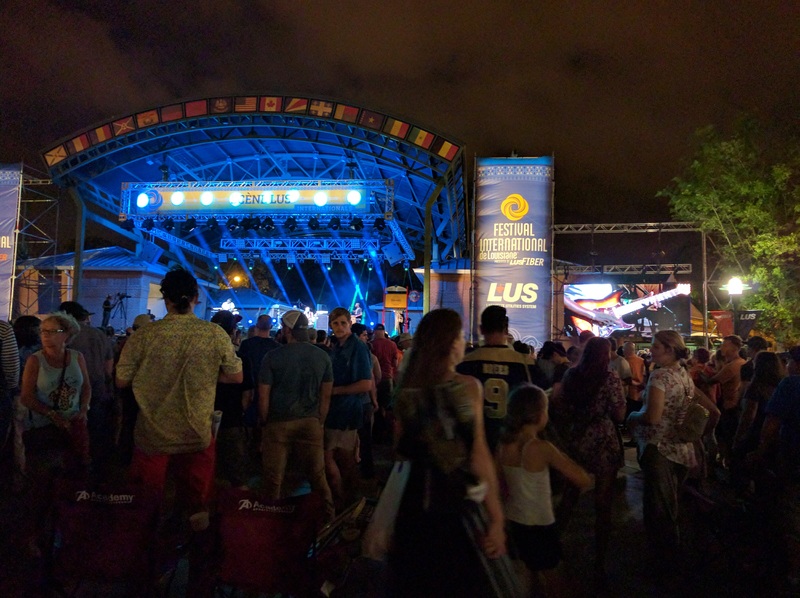 We all went out, the town is closed off and full of stages and we listened to Cajun music and music from all over the world…So great. I was rushing now, I only stayed a week and only have a few weeks left in the states…where did these 3 months go! I felt like I had not even touched a fraction of the USA. 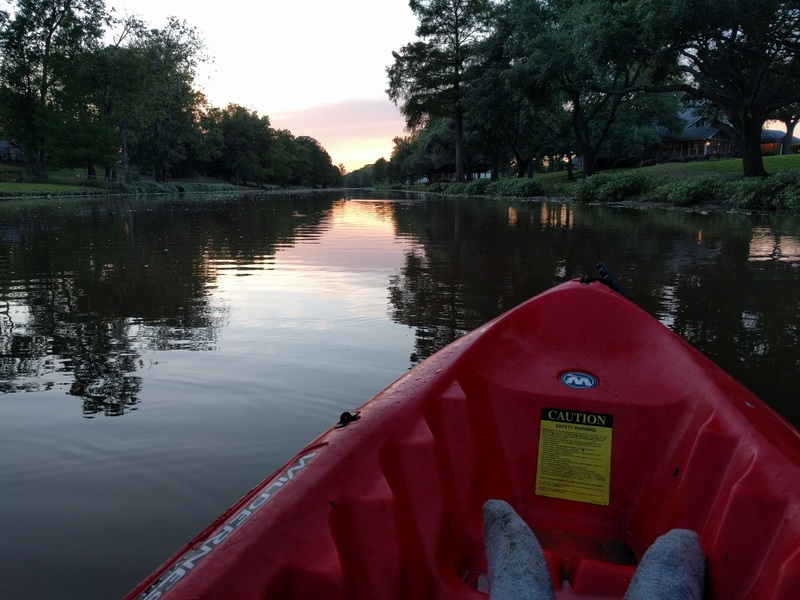 I could have definetly spent a while longer there, Helping with the gardening and then swimming in their pool in the afternoons, or kayaing down the Bayou behind their house..But its time to go, and cram in some more. So I had been in contact with John in Texas, who was a Friend of someone back home. John put something up on facebook asking if anyone had somewhere for me to crash and Chris was who came back. If there is one thing I can take away from travelling is that people are awesome, and that it has encouraged me to be awesome back to everyone. I caught a train, from Lousiana to Austin, Texas. Spent a night sleeping in a train station, with multiple dead arms and exploring San Antonio at 2 in the morning. At this point meeting with people I have never met, spending time and staying with them for a few nights, a night or a week was becoming normal. Chris was awesome, we jammed out on the guitars, he helped me write a song and we hung out for like a boys weekend while his partner was away. 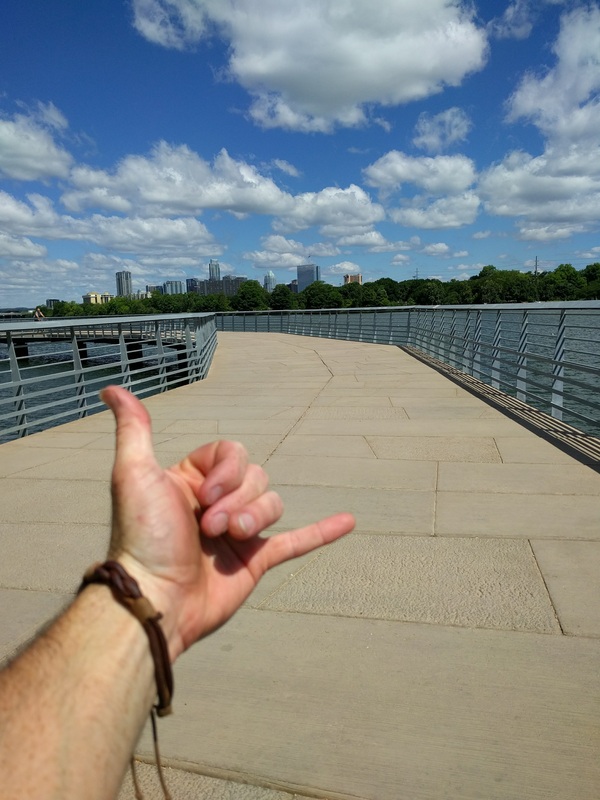 Austin was awesome, probably my favourite city so far. Very new, full of musical influence and progressive. I went busking down on one of the main streets for my friday night, it was fun performing for people, chatting and generally just getting to jam, share my music and try and make a little of difference financially. By this point I had finally found someone to give my bag and gear to after searching and trying, So I gave it away…it was very relaxed, just a thank you, a hug and I wished them to use it well. 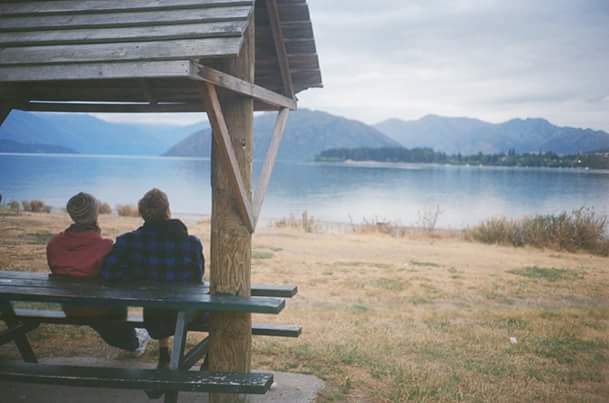 I love to go out and meet new people while I’m travelling on my own, so ive have been alot on my own. Just to listen to music, or have a coffee or few drinks a couple of times. Its hard not to feel creepy sitting there on your own but its amazing the connections and people that you meet when you sit alone. I did the same in Austin and its always a laugh, seeing what people know about where you are from and I love hanging out with people that I have never met. I had been trying very hard to make it up to Utah to go paragliding, I was so keen on that but me being me..I only just checked my itinerary and I was flying a week earlier than I had been telling everyone so back to Pennsylvannia for me to pick up my Basketball chair and have a week in New York to experience that Big Apple. I was going to hitchhike from Austin back to the east coast, and test out the Hammock I had got. Turns out 12 O-clock that night Before I was going to try Hitchhike tomorrow, I booked a 49 hour train ticket back to the east coast via Chicago. So random. I was running out of time, and didn’t want to miss my flight over to europe. 40 hours on the train, In chicago before my next train. The train ride was long, but unlike a plane I can use my chair to get to the toilets which is always my main worry while travelling because I pee ALOT. 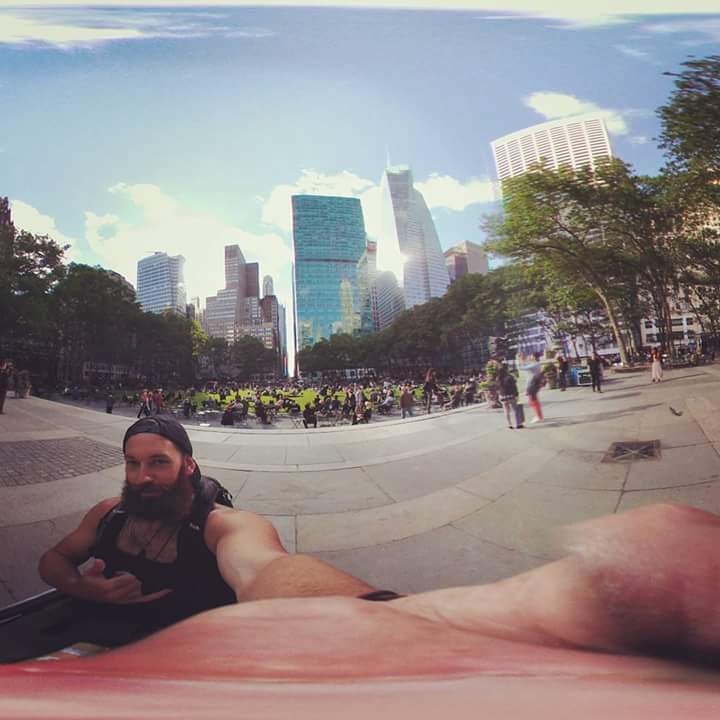 Met a bunch of people, saw a bunch of landscape and made it to Pennsylvannia eventually where I spent a couple of nights back with Priscella at the church, picked up my basketball chair and caught a train up to New York…The last stop. New york was how I thought it would be, busy and alot of things to see and do. I did alot of pushing around the city and the hostel I stayed in was full of wonderfully friendly people and staff. Cruising around the city having coffees and laying in parks, trying to break down the locals barriers. Now to the airport to board the plane to Spain, say goodbye to America and meet up with Julie to travel around Europe. 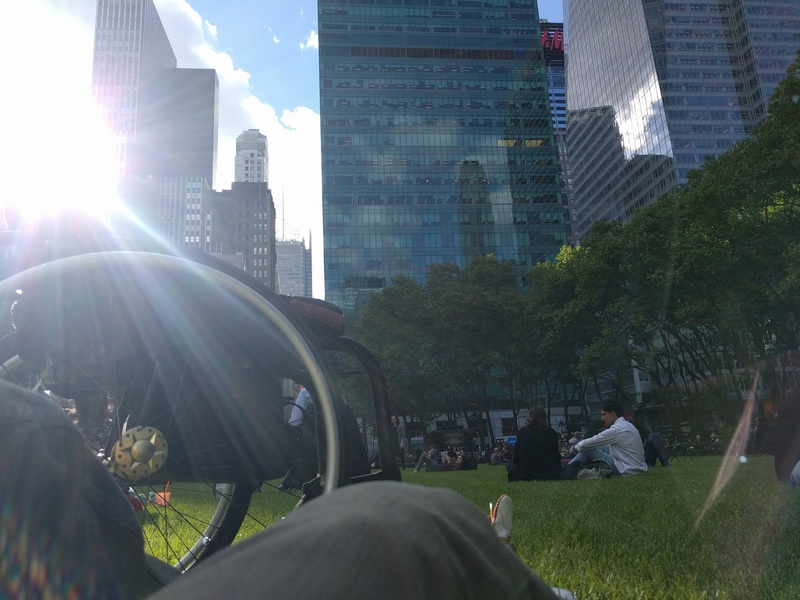 Bryant park in NYC, so nice to lay down with everyone enjoying the sun through the buildings. America, I learned to let go of the things I thought I needed but didn’t..To not judge and be open to everyone. I pushed myself further into situations where I had no control and more importantly to start flowing with whereever it was I was going. This is why I came travelling, so thank you. Life is simple, or as complex as you make of it. If you look at the universal language of mathematics all of life’s equations are a balance…one side of the equation is the simplest form of the answer, and the other side a more in depth complex version of the same answer. Different perspectives of the same thing. A + B = C , both equal C.
Follow your heart, the mind does a lot of our work and is the reason for the in depth complex version of the equation and a lot of my happiness comes from the simplicity of the choices I make, and the paths I go down. The mind is amazing and beautiful, But can override the heart and life can pass by. Ask yourself what makes you happy, honestly happy. 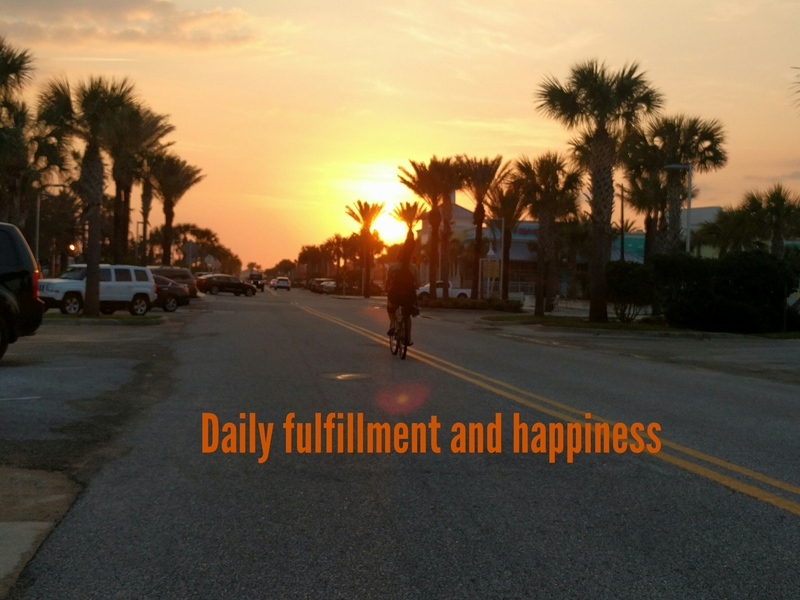 Are you doing what makes you happy? don’t forget to look at the equation from both sides. I believe happiness, true happiness comes from the love of something. Love I think comes from the mind and heart being in harmony, my mind is always busy but as I quieten and have faith in my instincts, and trust my heart to have more of a say what direction I go I am instantly happier. everyday I make decisions totally based on my emotion without a thought involved, no future , no past ..just now. Be honest, Be honest with yourself and everything else. Being honest is hard, it can go against human nature to trust and have an honest existence. To have the intention of honesty creates trust, trust encourages love. 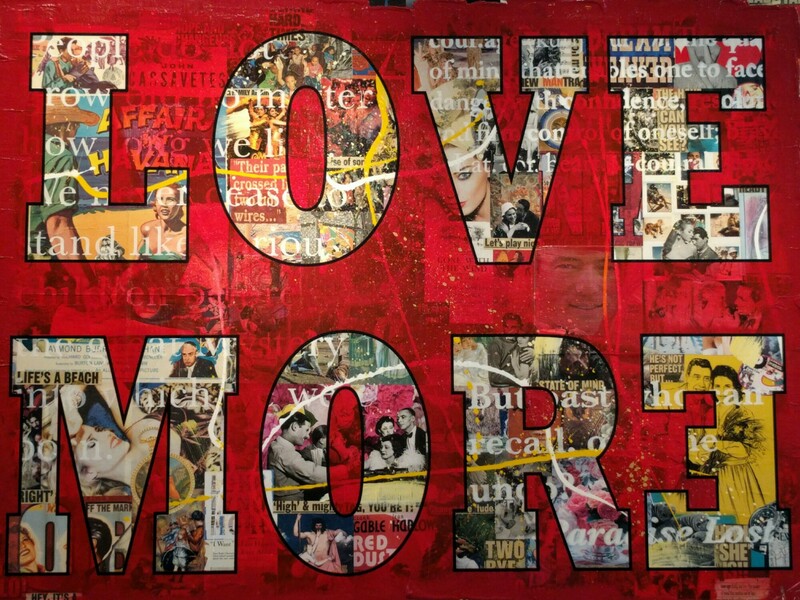 Love is expansive and expands your awareness and the awareness of people around you. Honesty takes practice and I practice honesty which each person I meet. To be honest with yourself, all your actions create a reaction and to accept the reaction with honesty and without excuse. The quicker the acceptance of this reaction, the more you move forward with the next action. for example your goals, or your direction, your relationships with all things around you evolve/flow with less resistance when the last reaction, good or bad, is accepted honestly. Spend a moment of everyday in the moment, we all get caught up in work, relationships, money and everything that seems to be relaxant to the modern day. Our minds fill up with huge amounts of information and emotions… So take one moment to stop everything, be totally aware of everything around you and the world you live in. To have things put into perspective, to smell the air that gives you life, to watch the trees and the sky that also provide the life we are living. The beauty is that it is free, you can do it anywhere and there is no time limit. It’s all transferrable, you bring yourself into the moment before a sporting match your about to play, before a presentation, a date, or anytime things start to become overwhelming. Respect and compassion, It starts within myself which means that I have to respect my body and I try to exercise, which doesn’t necessarily mean go pump weights at the gym, but just spend time outside, drink water and eat foods that have some nutritional value. Healthy body, healthy mind. A lot of happiness can be chemical too, and food is our fuel. If we put bad fuel into our bodies, it won’t run as smoothly. Then to have respect and compassion for our fellow man, all living things around us. Every single day of our life’s we are interacting with everything, just as everything around us is interacting back. To have respect and compassion, to have an openness to these interactions whether we understand it or not is one of the main sources of my fulfillment in this life. Most of all, drive yourself…have the best existence that you desire to have. Appreciate the good times, appreciate the hard times. Its all life! although some choices are taken away from you, you have the absolute ability to control the perspective at which you look at any and all of life paths. We are all from the same place, a place being something that is everything. A place is simply an existance, whether it is observable, thinkable or something that is felt. The observable place of our time is the universe and in time it may be that we understand that its even bigger than that. We are all going to end up in this same place, one way or another. To treat each and everyone with respect, honesty and love. Smile at everyone because love reflects love, when I smile at you, you smile in reflection even if it’s an smile inside. We all have our goals in this life, but we have our goals as a human race too. Regardless of race, disability, age, beliefs or financial status our goal as a human race is to work together with love and unity, because in the speck of life of the universe that we have seen, in ages to come if hate and war is how we survive I would have rather died in a time of unity and peace. If I die tomorrow with love and unity, I will have died happy. Living for an eternity at the price of hate and non trust, is that worth our basic instinct of survival?. Any act is justified if it’s done with honesty, love and respect..even death.